Learn the wealth-building strategies that Sir John Templeton used to become a billionaire and one of the greatest philanthropists of the modern era! There's a secret this wealth builder used that defies the strategies of almost everyone else: Use spiritual principles to guide you to wealth. To make this approach work for you, it's important that you understand more about what makes this special man tick. In his time, Templeton was the only American investment counselor specializing in investing outside the United States. He always understood his investment strategies as a reflection of his spiritual confidence and flexibility. Templeton's investment philosophy was to look for what he calls the point of maximum pessimism and to accommodate anxious, panicky sellers by buying their stocks. At the other end of the market, he aided excited and acquisitive buyers by selling them the stocks they craved. Spiritual fortitude gave him the strength to go against the tide and do what others would not. In fact, Sir John's spiritual imperatives made him super-rich, put 22 honorary degrees in the trophy room of his Nassau home, won him his knighthood, and drive his John Templeton Foundation to spend more than $30 million a year to forge an alliance between the great spiritual traditions and the skeptical, searching approach of science. Here was one nice guy who proved that the saying "nice guys finish last" is absolutely false. Early in Templeton's prosperous career, Princeton Theological Seminary recruited him to its board, eventually as its chairman. "In 30 years on the board, very few new ideas came to us," he told a friend. "A doctor today would never prescribe the treatments that my grandfather used as a surgeon in the Confederate Army, but a minister says pretty much the same thing today that a minister would have said back then. "The chief handicap of religious people," he said, "is that they tend to start with all the answers and don't change them, while scientists start with questions." This is key. When it comes to spiritual principles, many people, even the nice ones, assume they know all they need to know, and because of that, they never make any progress. By adopting a "Humility Theology," Sir John was always aware of how little he really did know, and that caused him to search his entire life for more answers. To encourage progress in religious thought, in 1971, he set up the annual Templeton Prize, $1 million (today it's $1.3 million) for whoever makes the most substantial innovation in religion each year. Mother Teresa won the first prize in 1971 for her advances in loving the dying. Astrophysicist Freeman Dyson won more recently for his brilliant synthesis of scientific evidence that atoms behave "like active agents rather than inert substances" and for his insights into the nature of God from a scientific perspective. So the excitement in science is a function of moving beyond comprehension, beyond the confident laws of 19th-century physics, into the divine uncertainties of today's chaos and string theory. That's just the kind of serene and searching mind Sir John hoped to nourish when he set up the Templeton Prize as his "first major program to encourage other people to become more humble." His larger goal is "making people get over the concept that they've got the total proof. To get them to feel, 'Gee, I want to learn more. I want to hear anybody who can tell me something in addition to ways I already know about God or my spiritual principles.' "
Sir John is warmly aware of the irony he creates with an innovation award in a field that mainly looks into the rear-view mirrors of Scripture. That's his point. "If we become increasingly humble about how little we know, we may be more eager to search," he wrote recently. "Humanity now spends over $1 billion per day on research. If even one-tenth of that could be devoted to spiritual research, the discoveries might be even more amazing and beneficial than those in the past century in electronics, medicine, genetics, subatomic physics, astronomy, et cetera." This is a lot more than a view of Sir John's approach to philanthropy. A genuinely humble approach to life is also your blank check. And the funds can be drawn from the Laws of Inner Wealth. "A person in business who is trying to serve himself will not likely be successful. Why? Because the customer will realize that he is self-centered and will avoid him. You wouldn't go to a doctor you couldn't trust. You wouldn't go to a lawyer you couldn't trust. You wouldn't deal with a store you couldn't trust. So we would invest in companies who tried to help the customer, to love the customer." He continues: "The concept that you have a life in business and a separate life spiritually is false. The two go hand in hand. The spiritual principles you live by show up in business, in the way you work with colleagues, the way you try to help your customers, the way you treat your competitors. The key is to focus on one thing ..."
That one thing is the most valuable secret Sir John ever learned. It is the key principle that convinced him there were laws of inner wealth that, when followed, would make a person rich spiritually as well as materially. And in The Laws of Inner Wealth: Principles for Spiritual and Material Abundance, he reveals these laws to you. I want to instill my life with meaning and contribute to my lasting improvement! 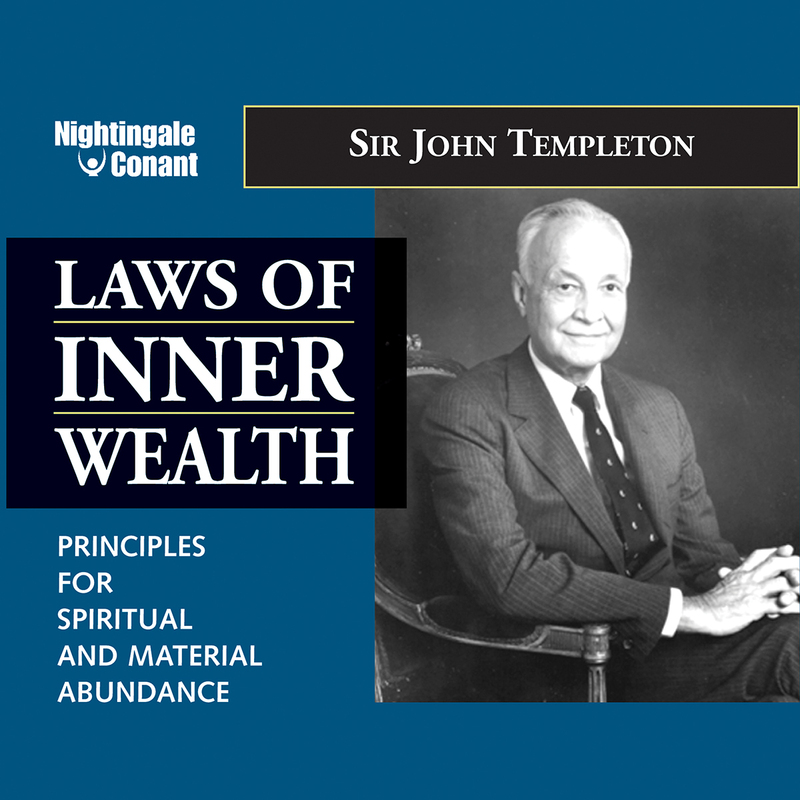 The Laws of Inner Wealth are what allowed Sir John Templeton to become a billionaire. The program encapsulates the thinking of one of the greatest investors the world has ever seen as it reveals the principles that allowed him to become one of the wealthiest people in the world. Templeton saw harmony between spirituality and good business in the same way he sees harmony between spirituality and science. Good spiritual fundamentals can lead to good business practice as well as good science. And together they can advance the human race to new levels of wealth, on a societal as well as an individual level. In other words, using these principles, we can become richer personally and materially while we also improve our society at large. According to Templeton, the closed-minded spiritual egotism of the past must be abandoned, and a new, open-minded humility must take its place in order for a person to experience true spiritual wealth. And humility is also a necessity for a person to attain material wealth. Think about it: If you already know everything, you won't see a need to learn anything more. And if a person has this attitude, he or she won't learn anything more and will not advance in wealth. In the spiritual area, what people experience is largely subjective. But in the material world, there's an easy litmus test. How wealthy are you? And how much curiosity do you have to learn more? If you are not as wealthy as you would like to be, but at the same time you don't have an active drive to learn more, then that means more humility is necessary. And the first place humility starts is in your spiritual life. Ironically, know-it-alls will tend to be poorer, both spiritually and materially. They make it their business to tell everyone else what they should be doing, while taking little initiative to learn anything new on their own. The Laws of Inner Wealth were put together by a billionaire as the guiding principles that allowed him to rise to his position of prominence and abundance. They are not the be-all and end-all of inner wealth—that would be an egotistical position. But they are one of the products of the 80-plus years of experience Sir John Templeton has had in life, and given his amazing accomplishments, everyone can learn something from what he has to say. The inseparable link between the invisible thoughts and feelings of our minds and the visible actions we take as a result of them. Which thoughts and feelings bring about the actions that lead to wealth. How to make your own joy without depending on circumstances or meeting conditions. How to gain a deep and abiding peace that can't be obtained from material wealth alone. Why the transformation of your inner spirit will have more impact on your external circumstances than any get-rich-quick formula ever could. The one key to getting everything you want from life. Set this principle in motion, and it will pay you huge dividends. How to avoid suffering and be uplifted by challenges even when you are experiencing pain. Essential self-presentation techniques that virtually guarantee that only good things will come your way. Why common mantras like "go for it" and "get ahead no matter what it takes" reflect failure-prone attitudes. The difference between a problem and a question, and why most of your "problems" aren't really problems at all! Three potent stress relievers you won't find in any pharmacy. Two essential guidelines for creating habits and attitudes that will make you rich. Five ways to discover your special talents by using internal resources no career counselor will ever uncover. Two simple techniques that offer fast help when resolving challenges. Twelve billion-dollar savings and investment strategies that produce spiritual as well as material rewards. I hope you have your blank check ready, because once you have The Laws of Inner Wealth, you will be able to draw unlimited riches from the program. It's extremely rare for Nightingale-Conant to publish an entire program from one of the richest people in the world. You may know a few millionaires, but how many billionaires have you ever learned from? Most people who underachieve in life do so because they believe their material goals are in direct conflict with their spirituality. When you go ahead and order The Laws of Inner Wealth by Sir John Templeton, you will discover how wrong that assumption is. Spiritual and material goals can work together synergistically. In fact, there is an intimate relationship between material and spiritual wealth. You don't need to compromise your values to succeed. The opposite is true. The more you live by the values in The Laws of Inner Wealth, the more your material circumstances will reflect that wealth. It's a strange assumption for some people, but Sir John Templeton is living proof of its veracity. P.S. This program will give you an inside view of how an extraordinarily successful mind works – the mind of a billionaire: There's humility here, but also great power and many years of experience in risk-taking and high-stakes money games. The Laws of Inner Wealth reflects a strategic, practical method that has made its author monumentally rich – one of the richest men in the world. It offers a perspective no ambitious person should be without. I want to be inspired to consider more deeply the laws I live by, and to reap the rewards of their practical application.